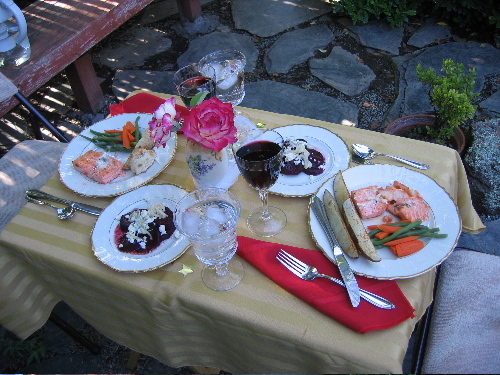 Last night my husband Jim and I celebrated our twenty-fourth year of marriage with a romantic dinner for two. 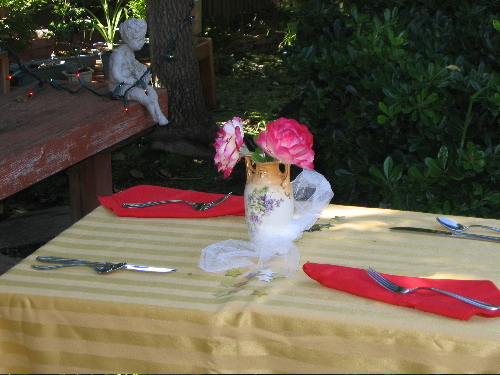 I will share the menu with you, but first allow me to set the scene. 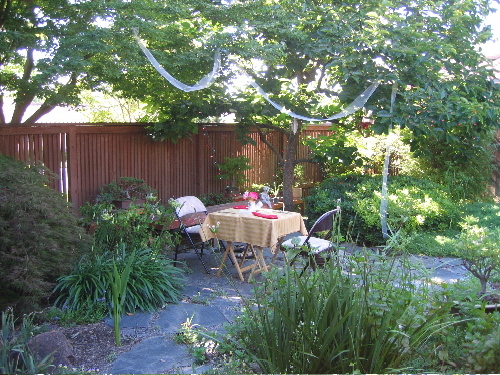 We are blessed with a secluded garden at our home. With a little help from our two sons, Evan (19) and Ethan (15), I set about to transform the garden in to a Love Grotto where Jim and I could dine in privacy. My first challenge was to find a flat enough place on the flagstones to place table and chairs. It took some hunting until I found the right spot. (I hate a wobbly table). Because I don't have a small cafe table, I was able to put two little fold up tray tables together and cover them with a burnished gold cloth. If you look closely, you can see the strings of colorful lights we looped from the eaves over to the table area, creating drama, mystery, and potential choking hazard for my surprised husband as he came home from work. 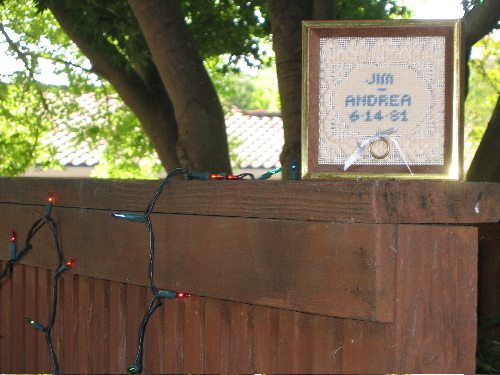 (The walkway to the front door leads one to the fenced garden area, and this is where the lights began their journey to the grotto.) 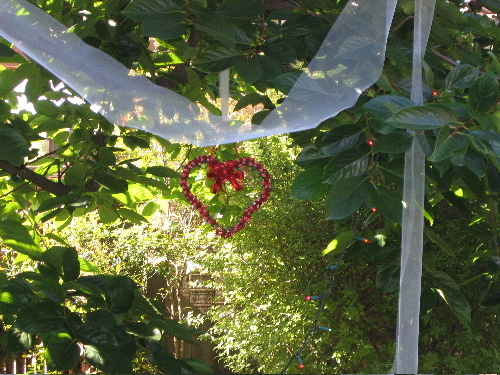 For further definition of the table area, we draped white tulle in the tree boughs, which wafted gently in the cooling breeze with the wind chimes. Finally, a word about our menu. I broiled salmon served with garlic-rosemary butter, seasoned potatoe wedges, and (slightly overcooked) steamed beans and carrots. In addition I served a beet and gorgonzola salad with a shallot and lemon vinagrett. 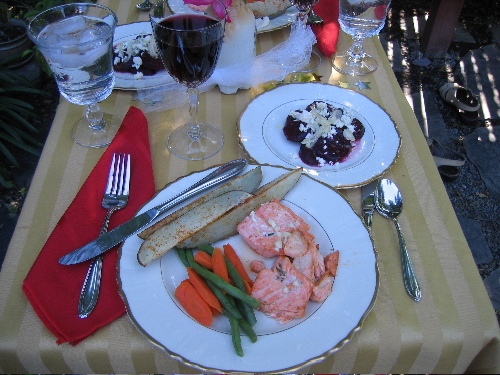 A glass of merlot was perfect with the rich salmon and cold beet salad. For dessert we ate a three berry compote, deliciously sweetened with Stevia. A home cooked and special meal is more romantic than a hundred such meals eaten out...but then again, I remain smitten with a guy who is truly my best friend and still the sexiest man I have ever met. After dinner, he even read me poetry! (Swoon). (Even typing it out makes me weepy). Whether dining out or in, sharing food remains one of the most pleasurable ways to say I Love You.